An illustrated image of the Lotus Sūtra, which is highly revered in Nichiren Buddhism. From the Kamakura period, circa 1257. Ink, color, and gold leaf on paper. Nichiren Buddhism(Japanese: 日蓮宗) is a branch of Mahayana Buddhism based on the teachings of the 13th-century Japanese Buddhist priest Nichiren (1222–1282) and is one of the Kamakura Buddhism schools. :239 Its teachings derive from some 300–400 extant letters and treatises attributed to Nichiren. With the advent, and proselytizing efforts, of the Soka Gakkai International, called "the most prominent Japanese 'export' religion to draw significant numbers of non-Japanese converts, Nichiren Buddhism has spread throughout the world. Within Nichiren Buddhism there are two major divisions which fundamentally differ over whether Nichiren should be regarded as a bodhisattva of the earth, a saint, great teacher—or the actual Buddha of the third age of Buddhism. Several Japanese new religions are Nichiren-inspired lay groups. It is practiced worldwide, with practitioners throughout the United States, Brazil and Europe, as well as in South Korea and southeast Asia. The largest sects are the Soka Gakkai/(Soka Gakkai International), Nichiren Shu, and Nichiren Shoshu. Nichiren Buddhism focuses on the Lotus Sutra doctrine that all people have an innate Buddha-nature and are therefore inherently capable of attaining enlightenment in their current form and present lifetime. Nichiren proposed a classification system that ranks the quality of religions:128 and various Nichiren schools can be either accommodating or vigorously opposed to any other forms of Buddhism or religious beliefs. The practice of chanting Nam Myoho Renge Kyo accompanied by selected recitations of the Lotus Sutra and teaching others to do the same. The study of Nichiren's scriptural writings called Gosho. Traditional Nichiren Buddhist temple groups are commonly associated with Nichiren Shoshu and varying Nichiren Shu schools. There are also modern 21st-century lay groups not affiliated with temples such as Soka Gakkai, Kenshokai, Shoshinkai, Risshō Kōsei Kai, and Honmon Butsuryū-shū. Nichiren's teachings encompass a great many concepts. Briefly, the basic practice of Nichiren Buddhism is chanting the invocation Nam-myoho-renge-kyo to a mandala inscribed by Nichiren, called the Gohonzon. Embracing Nam-myoho-renge-kyo entails both chanting and having the mind of faith (shinjin). :270 Both the invocation and the Gohonzon, as taught by Nichiren, embody the title and essence of the Lotus Sutra, which he taught as the only valid scripture for The Latter Day of the Law, as well as the life state of Buddhahood inherent in all life. The specific task to be pursued by Nichiren's disciples was the widespread propagation of his teachings (the invocation and the Gohonzon) in a way that would effect actual change in the world's societies:47 so that the sanctuary, or seat, of Buddhism could be built. Nichiren saw this sanctuary as a specific seat of his Buddhism, but there is thought that he also meant it in a more general sense, that is, wherever his Buddhism would be practiced. :111 This sanctuary, along with the invocation and Gohonzon, comprise "the three great secret laws (or dharmas)" found in the Lotus Sutra. The target of his tactics expanded during the early part of his career. Between 1253 and 1259 he proselytized and converted individuals, mainly attracting mid- to lower-ranking samurai and local landholders:445 and debated resident priests in Pure Land temples. In 1260, however, he attempted to directly reform society as a whole by submitting a treatise entitled "Risshō Ankoku Ron" ("Establishment of the Legitimate Teaching for the Protection of the Country") to Hōjō Tokiyori, the de facto leader of the nation. Nichiren's teachings reached their full maturity between the years 1274 and 1282 while he resided in primitive settings at Mount Minobu located in today's Yamanashi Prefecture. During this time he devoted himself to training disciples,:261 produced most of the Gohonzon which he sent to followers,:377 and authored works constituting half of his extant writings:191:115 including six treatises that were categorized by his follower Nikkō as among his ten most important. A prolific writer, Nichiren's personal communiques among his followers as well as numerous treatises detail his view of the correct form of practice for the Latter Day of the Law (mappō); lay out his views on other Buddhist schools, particularly those of influence during his lifetime; and elucidate his interpretations of Buddhist teachings that preceded his. These writings are collectively known as Gosho (御書) or Nichiren ibun (日蓮遺文). Which of these writings, including the Ongi Kuden (orally transmitted teachings), are deemed authentic or apocryphal is a matter of debate within the various schools of today's Nichiren Buddhism. One of his most important writings the Rissho Ankoku Ron, preserved at Shochuzan Hokekyo-ji, is one of the National Treasures of Japan. The movement was supported financially by local warlords or stewards (jitõ) who often founded tightly-organized clan temples (ujidera) that were frequently led by sons who became priests. :169 Most Nichiren schools point to the founding date of their respective head or main temple (for example, Nichiren Shū the year 1281, Nichiren Shōshū the year 1288, and Kempon Hokke Shu the year 1384) although they did not legally incorporate as religious bodies until the late 19th and early 20th century. A last wave of temple mergers took place in the 1950s. The Itchi lineage today comprises most of the traditional schools within Nichiren Buddhism of which the Nichiren Shū is the biggest representative although it also includes some Nikkō temples. In this lineage the whole of the Lotus Sutra, both the so-called theoretical (shakumon or "Imprinted Gate") and essential (honmon or "Original Gate") chapters, are venerated. :192 While great attention is given to the 2nd and 16th chapter of the Lotus Sutra, other parts of the sutra are recited. In addition, Nikkō made accusatory charges that after Nichiren's death, other disciples slowly began to gradually deviate from what Nikkō viewed as Nichiren's orthodox teachings. Chief among these complaints was the syncretic practices of some of the disciples to worship images of Shakyamuni Buddha. Nikkō admonished other disciple priests for signing their names "Tendai Shamon" (of the Tendai Buddhist school) in documents they sent to the Kamakura government. Furthermore, Nikkō alleged that the other disciples disregarded some of Nichiren's writings written in Katakana rather than in Classical Chinese syllabary. In addition to using the letters to defend its claim to othodoxy, the documents may have served to justify Taiseki-ji's claimed superiority over other Nikkō temples, especially Ikegami Honmon-ji, the site of Nichiren's tomb. Even though there had been efforts by temples of the Nikkō lineage in the late 19th century to unify into one single separate Nichiren school the Kommon-ha, today's Nichiren Shōshū comprises only the Taiseki-ji temple and its dependent temples. It is not identical to the historical Nikkō or Fuji lineage. Parts of the Kommon-ha, the Honmon-Shu, eventually became part of Nichiren Shu in the 1950s. New religious movements like Sōka Gakkai, Shōshinkai, and Kenshōkai trace their origins to the Nichiren Shōshū school. During the Edo period, with the consolidation of power by the Tokugawa shogunate, increased pressure was placed major Buddhist schools and Nichiren temples to conform to governmental policies. Some Hokkeshū adherents, the followers of the so-called Fuju-fuse lineage, adamantly bucked this policy based on their readings of Nichiren's teachings to neither take (fuju) nor give (fuse) offerings from non-believers. Suppressed, adherents often held their meetings clandestinely which led to the Fuju-fuse persecution and numerous executions of believers in 1668.:150 During this time of persecution, most likely to prevent young priests from adopting a passion for propagation, Nichiren seminaries emphasized Tendai studies with only a few top-ranking students permitted to study some of Nichiren's writings. By this time Japanese Buddhism was often characterized by syncretism in which local nativistic worship was incorporated into Buddhist practice. For example, Tendai, Shingon, Jodō, and Nichiren temples often had chapels within them dedicated to Inari Shinto worship. :266 Within Nichiren Buddhism there was a phenomenon of Hokke Shintō (Lotus Shinto), closely influenced by Yoshida Shintō. Anti-Buddhist sentiment had been building throughout the latter part of the Tokugawa period (1603–1868). Scholars such as Tominaga Nakamoto and Hirata Atsutane attacked the theoretical roots of Buddhism. Critics included promoters of Confucianism, nativism, Shinto-inspired Restorationists, and modernizers. Buddhism was critiqued as a needless drain on public resources and also as an insidious foreign influence that had obscured the indigenous Japanese spirit. 1876: The Fuju-fuse-ha was recognized by the government after years of clandestine operation following episodes of persecution. In 1882 a second Fuju-fuse sect was recognized, the Fuju-Fuse Kōmon-ha. The ultranationalistic preoccupation with Nichiren that contributed to Japan's militaristic effort before World War II. Socialist activists and writers during the prewar and postwar eras who promoted a vision of an ideal world society inspired by the Lotus Sutra and according to their own views of Nichiren. Nichirenism also includes several intellectuals and activists who reacted against the prewar ultranationalistic interpretations and argued for an egalitarian and socialist vision of society based on Nichiren's teachings and the Lotus Sutra. These figures ran against the growing tide of Japanese militarism and were subjected to political harassment and persecution. 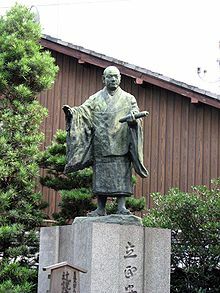 :425 A leading figure in this group was Girō Seno who formed the New Buddhist Youth League (Shinkō Bukkyō Seinen Dōmei). Originally influenced by the ideals of Tanaka and Honda, Giro Seno came to reject ultra-nationalism and argued for humanism, socialism, pacifism, and democracy as a new interpretation of Nichiren's beliefs. He was imprisoned for two years under the National Security Act. The same fate was also endured by Tsunesaburo Makiguchi, who refused the religious dictum of Shinto display accepted by Nichiren Shoshu for the Soka Kyoiku Gakkai, his lay organization composed of primarily secretaries and teachers until it grew to become Soka Gakkai after World War II. While various sects and organizations have had a presence in nations outside Japan for over a century, the ongoing expansion of Nichiren Buddhism overseas started in 1960 when Soka Gakkai president Daisaku Ikeda initiated his group's worldwide propagation efforts growing from a few hundred transplanted Japanese to over 3500 families just by 1962. Nichiren Buddhism is now practiced in many countries outside of Japan. In the United States Prebish coined the typology of "two Buddhisms" to delineate the divide between forms of Buddhism that appealed either primarily to people of the Asian diaspora or to Euro-American converts. Nattier, on the other hand, proposes a three-way typology. "Import" or "elite" Buddhism refers to a class of people who have the time and means to seek Buddhist teachers to appropriate certain Buddhist techniques such as meditation. "Export or evangelical" Buddhism refers to groups that actively proselytize for new members in their local organizations. "Baggage" or "ethnic" Buddhism refers to diaspora Buddhists, usually of a single ethnic group, who have relocated more for social and economic advancement than for evangelical purposes. :16 Another taxonomy divides Western Buddhist groups into three different categories: evangelical, church-like, and meditational. Nichiren Shu has been classified into the church-like category. :5 One of several Japanese Buddhist schools that followed in the wake of Japanese military conquest and colonization, Nichiren Shu opened a temple in Pusan, Korea in 1881. Its fortunes rose and diminished with the political tides but eventually failed. It also established missions in Sakhalin, Manchuria, and Taiwan. A Nichiren Shu mission was established in Hawaii in 1900. By 1920 it established temples at Pahala, Honolulu, Wailuku and Maui. In 1955 it officially started a mission in Brazil. :283 In 1991 it established the Nichiren Buddhist International Center in 1991 and in 2002 built a center in Hayward, California, to help overseas missions. However, Nichiren Shu does not widely propagate in the West. Some have characterized the Soka Gakkai as evangelical:5 but others claim that it broke out of the "Two Buddhisms" paradigm. It is quite multi-ethnic and it has taken hold among native populations in locations including Korea, Malaysia, Brazil, Europe, parts of Africa, India, and North America. The growth of the Soka Gakkai was sparked by repeated missionary trips beginning in the early 1960s by Daisaku Ikeda, its third president. :285 In 1975 the Soka Gakkai International was launched in Guam. :107–108 In the United States it has attracted a diverse membership including a significant demographic of African Americans. Since the 1970s it has created institutions, publications and exhibitions to support its overall theme of "peace, culture, and education." There is academic research on various national organizations affiliated with this movement::54 the United States, the United Kingdom, Italy, Canada, Brazil, Scotland, Southeast Asia, Germany, and Thailand. The Reiyukai conducts more typical missionary activities in the West. It has a membership of between five hundred and one thousand members in Europe, concentrated in Italy, Spain, England and France. The approximately 1,500 members of the Nihonzan Myohoji have built peace pagodas, conducted parades beating the drum while chanting the daimoku, and encouraged themselves and others to create world peace. Nichiren Shoshu has six temples in the United States led by Japanese priests and supported by lay Asians and non-Asians. There is one temple in Brazil and the residing priest serves as a "circuit rider" to attend to other locations. The following lists are based on English-language Wikipedia articles and the Japanese Wikipedia article on Nichiren Buddhism. In alphabetical order (Japanese characters preceded by "ja:" link to articles in the Japanese Wikipedia). Reiyūkai (Spiritual-Friendship-Association), founded in 1920 by Kakutaro Kubo and Kimi Kotani, Reiyūkai considers itself the grandfather of lay-based new religions devoted to the Lotus Sutra and ancestor veneration. Soka Gakkai, founded in Japan in 1930 by Tsunesaburō Makiguchi and Soka Gakkai International founded in 1975 by Daisaku Ikeda. ^ Iida, Shotaro (1987). "Chapter 5: 700 Years After Nichiren". In Nicholls, William (ed.). Modernity and Religion. Wilfrid Laurier University Press. pp. 98–105. ISBN 978-0-88920-154-5. ^ Arai, Nissatsu (1893). Outlines of the Doctrine of the Nichiren Sect, Submitted to the Parliament of the World's Religions. Tokyo, Japan: Central Office of the Nichiren Sect. p. vi. One who wants to know how high was his virtue, how profound and extensive was his learning, how heroic and grand was his character, and how gigantic and epoch-making was his mission, needs only to read his works. ^ Machacek and Wilson (2000). Global Citizens. Oxford, England: Oxford University Press. p. 2. ISBN 978-0-19-924039-5. ^ Hein, Patrick (2014). The Goddess and the Dragon: A Study on Identity Strength and Psychosocial Resilience in Japan. Cambridge Scholars Publishing. p. 67. ISBN 9781443868723. ^ a b Ellwood, Robert S.; Csikszentmihalyi, Mark A. (2003). "Chapter 12: East Asian Religions in Today's America". In Neusner, Jacob (ed.). World Religions in America: An Introduction. Westminster John Knox Press. p. 225. ISBN 9780664224752. ^ Cornille, Catherine (1998). "Canon formation in new religious movements: The case of the Japanese new religions". In Debeek, A. Van; Van der Toorn, Karel (eds.). Canonization and Decanonization. Brill. p. 284. ISBN 978-9004112469. ^ Shimazono, Susumu (2004). "Daimoku (Invocation)". In Clarke, Peter (ed.). Encyclopedia of new religious movements. Routledge. p. 151. ISBN 9781134499700. Moreover, many Nichiren-inspired new religions (see New Religious Movement) are lay Buddhist movements. The training and practices do not require advanced scholarly knowledge. They offer a type of Buddhism that ordinary people preoccupied with their families and occupations can practice without becoming priests and having to dedicate themselves exclusively to spiritual matters. ^ Hammond, Phillip (2000). "Foreword". In Macacheck and Wilson (ed.). Global Citizens. 2000: Oxford University Press. p. v. ISBN 978-0-19-924039-5. ^ Dobbelaere, Karel (1998). Soka Gakkai. Signature Books. p. 17. ISBN 978-1-56085-153-0. ^ "Nichiren: Fast Facts and Introduction". Religion Facts. Retrieved 14 December 2017. ^ Petzold, Bruno (1995). Ichimura, Shohei (ed.). The classification of Buddhism : comprising the classification of Buddhist doctrines in India, China and Japan = Bukkyō-kyōhan. Wiesbaden: Harrassowitz Verlag. p. 627. ISBN 9783447033732. ^ Stone, Jacqueline I (2012). "The Sin of "Slandering the True Dharma" in Nichiren's Thought" (PDF). Sins and Sinners : Perspectives from Asian Religions. Granoff, P. E. (Phyllis Emily, 1947–), Shinohara, Koichi (1941–). Leiden: Brill. ISBN 9789004232006. OCLC 809194690. ^ Fowler, Jeaneane and Merv (2009). Chanting in the Hillsides. Portland, Oregon: Sussex Academic Press. p. 141. ^ a b c d e f g h i j Anesaki, Masaharu (1916). Nichiren, the Buddhist Prophet. Harvard University Press. ^ Nichiren (1990). Yampolsky, Philip B (ed.). Selected writings of Nichiren. New York: Columbia University Press. p. 148. ISBN 9780231072601. Nam-myoho-renge-kyo appears in the center of the Treasure Tower with the Buddhas Shakyamuni and Taho seated to the right and left and the four Bodhisattvas of the Earth, led by Jogyo, flank them. ^ Metraux, Daniel (1996). "The Soka Gakkai: Buddhism and the Creation of a Harmonious and Peaceful Society". In King, Sallie; Queen, Christopher (eds.). Engaged Buddhism: Buddhist Liberation Movements In Asia. Albany, NY: State University of New York Press. pp. 366–367. ISBN 978-0-7914-2844-3. ^ Metraux. Engaged Buddhism. p. 368. ^ Metraux. Engaged Buddhism. p. 367. ^ Sato, Hiroo (1999). Habito, Ruben. "Nichiren's View of Nation and Religion". Japanese Journal of Religious Studies. 26/3-4: 319–320. ^ Hurst, Jane (1998). Nichiren Shoshu and the Soka Gakkai. Berkely: University of California Press. p. 86. ISBN 978-0-520-20460-7. ^ Montgomery, Daniel (1991). Fire In The Lotus. London: Mand ala (Harper Collins). p. 133. ISBN 978-1-85274-091-7. Basically, the Hommon No Kaidan is any place where a believer keeps the sutra. ^ Hurst. The Faces of Buddhism IN America. p. 84. ^ Payne, Richard K. (1998). "Introduction". Re-visioning "Kamakura" Buddhism. Honolulu: University of Hawaii Press. pp. 1–2. ISBN 978-0824820787. ^ Teiser, Stephen F.; Stone, Jacqueline I. (2009). "Interpreting the Lotus Sutra". Readings of the Lotus Sūtra. Teiser, Stephen F., Stone, Jacqueline Ilyse. New York: Columbia University Press. pp. 3–4. ISBN 9780231142892. OCLC 255015350. ^ a b c d e f g h i j k Habito, Ruben L.F. (1994). "The Uses of Nichiren in Modern Japanese History" (PDF). Japanese Journal of Religious Studies. 26/3–4. ^ Habito, Ruben L. F. (2009). "Bodily Reading of the Lotus Sutra". Readings of the Lotus Sūtra, Kindle Edition. Teiser, Stephen F., Stone, Jacqueline Ilyse. New York: Columbia University Press. 4727 (Kindle locations). ISBN 9780231520430. OCLC 255015350. ^ a b Lopez Jr., Donald S. (2016). The Lotus Sūtra : a biograph. Princeton. ISBN 9781400883349. OCLC 959534116. ^ Stone, Jacqueline I. (1999). "Priest Nisshin's Ordeals". Religions of Japan in practice. Tanabe, George J., Jr., 1943–. Princeton, NJ: Princeton University Press. ISBN 9780691057897. OCLC 39930710. ^ Osumi, Kazuyo (1988–1999). "Buddhism in the Kamakura period". The Cambridge history of Japan. Hall, John Whitney, 1916–1997., 山村, 耕造. Cambridge, UK: Cambridge University Press. ISBN 9780521223546. OCLC 17483588. ^ a b c d e f Stone, Jacueline I. "Biographical Studies on Nichiren" (PDF). Japanese Journal of Religious Studies. 26/3–4. ^ Heine, Steven (January 2005). "Japanese Buddhism: A Cultural History (review)". Philosophy East and West. 55/1: 125–126 – via Project MUSE. ^ a b c Bowring, Richard John (2005). The religious traditions of Japan, 500–1600. Cambridge, UK: Cambridge University Press. ISBN 9780521851190. OCLC 60667980. ^ a b c d e f g h Habito, Ruben L. F. (2009). Readings of the Lotus Sūtra. Teiser, Stephen F., Stone, Jacqueline Ilyse. New York: Columbia University Press. ISBN 9780231520430. OCLC 255015350. ^ a b c Kitagawa, Joseph M. (2010). Religion in Japanese History. Columbia University Press. ISBN 9780231515092. ^ See, Tony (2014). "Deleuze and Mahayana Buddhism: Immanence and Original Enlightenment Thought". In Hanping., Chiu (ed.). Deleuze and Asia. Lee, Yu-lin., Bogue, Ronald. Newcastle upon Tyne: Cambridge Scholars Publishing. ISBN 9781443868884. OCLC 893739540. ^ a b Stone, Jacqueline (2013). "Nenbutsu Leads to the Avici Hell: Nichiren's Critique of the Pure Land Teachings" (PDF). Proceedings of the Seventh International Conference on the Lotus Sutra. Rissho University. ^ Habito, Ruben L. F. (2009). "Bodily Reading of the Lotus Sutra". Readings of the Lotus Sūtra, Kindle Edition. Teiser, Stephen F., Stone, Jacqueline Ilyse. New York: Columbia University Press. 5585–5590 (Kindle locations). ISBN 9780231520430. OCLC 255015350. ^ Urbain, Olivier, ed. (2014). A Forum for Peace: Daisaku Ikeda's Proposals to the UN. New York: I. B. Taurus. pp. 479–486. ISBN 9781780768397. ^ Swanson, Paul (16 December 2013). Encyclopedia of Buddhism. Keown, Damien, 1951–, Prebish, Charles S. London. p. 548. ISBN 9781136985881. OCLC 865579062. ^ Stone, Jacqueline I (2012). "The sin of slandering the true Dharma in Nichiren's thought" (PDF). Sins and sinners : perspectives from Asian religions. Granoff, P. E. (Phyllis Emily), 1947–, Shinohara, Koichi, 1941–. Leiden: Brill. pp. 128–130. ISBN 9789004232006. OCLC 809194690. ^ Shonin, Nichiren (2002). Writings of Nichiren Shōnin. Tanabe, George Joji. Tokyo, Japan: Nichiren Shū Overseas Propagation Promotion Association. p. 345. ISBN 9780824825515. OCLC 54472063. ^ Fowler, Jeaneane (2009). Chanting in the hillsides : the Buddhism of Nichiren Daishonin in Wales and the Borders. Fowler, Merv. Brighton [England]: Sussex Academic Press. ISBN 9781845192587. OCLC 235028985. ^ Carr, Brian; Mahalingam, Indira (2002). Companion Encyclopedia of Asian Philosophy. Routledge. p. 702. ISBN 9781134960583. ^ Dolce, Lucia (1999). "Criticism and Appropriation Nichiren's Attitude toward Esoteric Buddhism". Japanese Journal of Religious Studies. 26/3–4. ^ a b Christensen, Jack Arden (2001). Nichiren : leader of Buddhist reformation in Japan. Fremont, Calif.: Jain Publishing Co. ISBN 9780875730868. OCLC 43030590. Lay summary. ^ "ten major writings – Dictionary of Buddhism – Nichiren Buddhism Library". www.nichirenlibrary.org. ^ a b c d e f Stone, Jacqueline I. (2014). "The Atsuhara Affair: The Lotus Sutra, Persecution, and Religious Identity in the Early Nichiren Tradition". Japanese Journal of Religious Studies. 41/1: 153–189. ^ "Atsuhara Persecution – Dictionary of Buddhism – Nichiren Buddhism Library". www.nichirenlibrary.org. ^ "Gosho – Dictionary of Buddhism – Nichiren Buddhism Library". www.nichirenlibrary.org. ^ a b Mori, Ichiu (2003). "Nichiren's View of Women". Japanese Journal of Religious Studies. 30/3–4: 280 – via Nanzan Institute for Religion and Culture. ^ a b c d e Alicia., Matsunaga (1988). Foundation of Japanese Buddhism. Vol. II, The mass movement (Kamakura & Muromachi periods). Matsunaga, Daigan. Los Angeles: Buddhist Books International. ISBN 978-0914910282. OCLC 137242947. ^ Koushiki, Choudhury (6 March 2017). Finding peace: an Oriental quest. London. ISBN 9788193315040. OCLC 974496695. ^ "Listing of Authenticated Gosho (Goibun) of Nichiren DaiShonin". ^ "Nichiren and His Time: Rissho ankoku ron". Kyoto National Museum. Archived from the original on 11 February 2013. ^ "Nichiren Shu Portal". www.nichiren-shu.org. ^ a b Stone, Jacqueline I. "Nichiren School". Encyclopedia.com. Retrieved 16 March 2018. ^ Harvey, Peter (2013). An introduction to Buddhism : teachings, history and practices (Second ed.). Cambridge: Cambridge University Press. ISBN 9780521859424. OCLC 822518354. ^ Chryssides, George D. (2012). Historical dictionary of new religious movements (Second ed.). Lanham, Md. : Scarecrow Press. ISBN 9780810861947. OCLC 828618014. ^ a b c Hardacre, helen (1989). "The Lotus Sutra in Modern Japan". The Lotus Sutra in Japanese culture. Tanabe, George J., Jr., 1943–, Tanabe, Willa J. (Willa Jane), 1945–, International Conference on the Lotus Sutra and Japanese Culture (1st : 1984 : University of Hawaii). Honolulu: University of Hawaii Press. ISBN 9780824811983. OCLC 18960211. In all areas of Japanese religions, the trend to lay centrality is among the most conspicuous historical developments of the nineteenth and twentieth centuries. By lay centrality I mean an increasingly important role for laity in all aspects of religious life and a weakening of the distinction between clerical and lay status. Lay centrality characterizes the nineteenth- and twentieth-century history of both Buddhism and Shinto and is closely related to the appearance of new religious groups outside the ecclesiastical hierarchy of either tradition. Lay centrality in Buddhism was stimulated after the Meiji Restoration by haibutsu kishaku (movement to destroy Buddhism), which became the occasion for serious reform within temple Buddhism. Early Meiji Buddhism witnessed the appearance of popularizers, ecumenical thought, and moves to initiate laity in the precepts, all aspects of the trend to lay centrality. ^ Ellwood, Robert S. (2003). "East Asian religions in today's America". World religions in America : an introduction. Neusner, Jacob, 1932–2016. (3rd ed.). Louisville, Ky.: Westminster John Knox Press. ISBN 9780664224752. OCLC 51613938. ^ Joshua A. Fogel. The literature of travel in the Japanese rediscovery of China, 1862–1945 ISBN 0-8047-2567-5. Stanford University Press, 1996. p. 29. ^ "Nichiren school – Dictionary of Buddhism – Nichiren Buddhism Library". www.nichirenlibrary.org. ^ E., Deal, William (31 March 2015). A cultural history of Japanese Buddhism. Ruppert, Brian Douglas, 1962–. Chichester, West Sussex, UK. ISBN 9781118608319. OCLC 904194715. ^ Morgan, Diane (2004). The Buddhist experience in America. Westport, Conn.: Greenwood Press. ISBN 9780313324918. OCLC 55534989. ^ Hughes, Seager, Richard (2012). "triple+refuge"#v=onepage&q=nichiren%20%22triple%20refuge%22&f=false Buddhism in America (Rev. and expanded ed.). New York: Columbia University Press. ISBN 9780231159739. OCLC 753913907. ^ Hein, Patrick (2014). The Goddess and the Dragon : a Study on Identity Strength and Psychosocial Resilience in Japan. Newcastle upon Tyne: Cambridge Scholars Publishing. ISBN 978-1443868723. OCLC 892799135. ^ Keown, Damien (2003). A dictionary of Buddhism. Oxford: Oxford University Press. ISBN 9780191579172. OCLC 574561654. ^ a b "Nichiren Buddhism". Philtar.ac.uk. Retrieved 2 October 2013. ^ 1949-, Dobbins, James C. (2002). Jōdo Shinshū : Shin Buddhism in medieval Japan. Honolulu: University of Hawai'i Press. ISBN 9780824826208. OCLC 48958350. ^ a b c Tamura, Yoshio (1989). The Ideas of the Lotus Sutra, In: George Joji Tanabe; Willa Jane Tanabe, eds. The Lotus Sutra in Japanese Culture. University of Hawaii Press. pp. 50–51. ISBN 978-0-8248-1198-3. ^ Nosco, Peter (1996). "Keeping the faith: Bakuhan policy towards religions in seventeenth century Japn". Religion in Japan : arrows to heaven and earth. Kornicki, Peter F. (Peter Francis), McMullen, James, 1939-. New York: Cambridge University Press. ISBN 9780521550284. OCLC 32236452. ^ a b c d Stone, Jacqueline (1994). "Rebuking the Enemies of the Lotus: Nichirenist Exclusivism in Historical Perspective" (PDF). Japanese Journal of Religious Studies. 21/2–3: 231–259. ^ Walter, Mariko Namba (2008). "The structure of Japanese Buddhist funerals". Death and the afterlife in Japanese Buddhism. Stone, Jacqueline Ilyse,, Walter, Mariko Namba. Honolulu: University of Hawaiʻi Press. ISBN 9780824832049. OCLC 657757860. ^ Jansen, Marius B.; Rozman, Gilbert (2014). "Overview". Japan in Transition : From Tokugawa to Meiji. Marius B. Jansen and Gilbert Rozman. Princeton: Princeton University Press. ISBN 9781400854301. OCLC 884013523. ^ Hardacre, Helen (1 November 2016). Shinto : a history. New York. ISBN 9780190621728. OCLC 947145263. ^ "Hokke Shinto". Encyclopedia of Shinto. ^ Hardacre, Helen (2003). "Hokke Shinto: Kami in the Nichiren tradition". Buddhas and Kami in Japan: Honji Suijaku as a Combinatory Paradigm. Fabio Rambelli, Mark Teeuwen (eds.). Routledge. pp. 222–254. ISBN 9781134431236. ^ Stone, Jacqueline I. "Zen Books Reviewed: Of Heretics and Martyrs in Meiji Japan: Buddhism and Its Persecution by James Edward Ketelaar". The Zen Site. ^ a b c Collcutt, Martin (2014). "Buddhism: The threat of eradication". Japan in Transition : From Tokugawa to Meiji. Marius B. Jansen and Gilbert Rozman. Princeton: Princeton University Press. ISBN 9781400854301. OCLC 884013523. ^ a b Covell, Stephen G (2006). "8: Buddhism in Japan, The creation of traditions". Buddhism in world cultures : comparative perspectives. Berkwitz, Stephen C., 1969–. Santa Barbara: ABC-CLIO. ISBN 9781851097821. OCLC 70136919. ^ Gier, Nicholas F. (2016). "Buddhism and Japanese Nationalism: A Sad Chronicle of Complicity". The Origins of Religious Violence: An Asian Perspective. Lanham, MD: Lexington Books. ISBN 9781498501880. ^ Kraemer, Hans M. (17 November 2016). "Shimaji Mokurai: Petition in Criticism of the Three Articles of Instruction". Religious dynamics under the impact of imperialism and colonialism : a sourcebook. Bentlage, Björn, 1979-. Leiden. ISBN 9789004329003. OCLC 951955874. ^ Yoshinaga, Shin'ichi (July 2009). "Theosophy and Buddhist Reformers in the Middle of the Meiji Period". Japanese Religions. 24 (2): 122. ^ 1953-, Sawada, Janine Anderson (2004). Practical pursuits : religion, politics, and personal cultivation in nineteenth-century Japan. Honolulu. p. 181. ISBN 9780824827526. OCLC 875895206. ^ "Revisiting Nichiren; Ruben L. F. Habito and Jacqueline I. Stone". ^ Kodera, Takashi James (March 1979). "Nichiren and His Nationalistic Eschatology". Religious Studies. 15 (1): 41–53. doi:10.1017/s0034412500011057. JSTOR 20005538. ^ Shields, James Mark (29 April 2016). "Opium Eaters: Buddhism as Revolutionary Politics". Buddhism and the political process. Kawanami, Hiroko. Basingstoke, Hampshire. p. 223. ISBN 9781137574008. OCLC 949365321. ^ Tsunesaburo Makiguchi Website Committee. "Tsunesaburo Makiguchi". Religious Reformer. Soka Gakkai. ^ Montgomery, Daniel (1991). Fire In The Lotus. London: Mandala. p. 210. ISBN 978-1-85274-091-7. ^ Prebish, Charles S. (1979). American Buddhism. North Scituate, Massachusetts: Duxbury Press. p. 51. ^ Prebish, Charles S. (1993). "Two Buddhisms Reconsidered". Buddhist Studies Review. 10 (2): 187–206. ^ Prebish, Charles S. (1999). Luminous Passage: The Practice and Study of Buddhism in America. Berkeley, CA: University of California Press. pp. 57–63. ^ Numrich, Paul David (1999). Old wisdom in the New World : Americanization in two immigrant Theravada Buddhist temples. Knoxville: University of Tennessee Press. p. 144. ISBN 9781572330634. OCLC 47793242. ^ Cheah, Joseph (2011). Race and religion in American Buddhism : white supremacy and immigrant adaptation. Oxford: Oxford University Press. ISBN 9780199843152. OCLC 774295742. ^ a b c Hickey, Wakoh Shannon (2010). "Two Buddhisms, Three Buddhisms, and Racism". Journal of Global Buddhism. 11: 5–6. ^ Sorensen, Henrik Hjort (1992). "Japanese Missionaries and Their Impact on the Revival of Korean Buddhism at the Close of the Choson Dynasty". Asian perceptions of nature : papers presented at a workshop, NIAS, Copenhagen, Denmark, October 1991. Henrik Hjort Sorensen, Ole Bruun, Arne Kalland, Nordic Institute of Asian Studies. Copenhagen: Nordic Institute of Asian Studies. pp. 50, 53. ISBN 9788787062121. OCLC 28815678. ^ a b Hirai, Chishin (2015). "Nichiren shū". Asian American religious cultures. Lee, Jonathan H. X.,, Matsuoka, Fumitaka,, Yee, Edmond, 1938–, Nakasone, Ronald Y. Santa Barbara. p. 682. ISBN 9781598843316. OCLC 895731298. ^ a b Usarski, Frank; Shoji, Rafael (2016). "Buddhism, Shinto and Japanese New Religions in Brazil". Handbook of contemporary religions in Brazil. Schmidt, Bettina E. Leiden. ISBN 9789004322134. OCLC 953617964. ^ Patrick., Hein (2014). The Goddess and the Dragon : a Study on Identity Strength and Psychosocial Resilience in Japan. Newcastle upon Tyne: Cambridge Scholars Publishing. p. 71. ISBN 9781443868723. OCLC 892799135. ^ Metraux, Daniel A. (2016). "Soka Gakkai International: Nichiren Japanese Buddhism". Global Religious Movements Across Borders: Sacred Service. Stephen M. Cherry, Helen Rose Ebaugh. Routledge. p. 87. ISBN 9781317127338. ^ a b Marshall, Katherine (2013). Global institutions of religion : ancient movers, modern shakers. London: Routledge. ISBN 9781136673443. OCLC 852158691. ^ Pinn, Anthony G. (2006). The African American religious experience in America. Westport, Conn.: Greenwood Press. p. 52. ISBN 9780313325854. OCLC 71065068. ^ Chappell, David W. (2000). "Racial Diversity in the Soka Gakkai". Engaged Buddhism in the west. Queen, Christopher S. Boston, MA: Wisdom Publications. pp. 184, 190, 203. ISBN 9780861711598. OCLC 844350971. ^ Seager, Richard (17 December 2014). Religion and American cultures : tradition, diversity, and popular expression. Gary Laderman, Luis D. León (Second ed.). Santa Barbara, California. ISBN 9781610691109. OCLC 897907045. ^ Machacek, David W. (2006). "Soka Gakkai: A Human revolution". Introduction to new and alternative religions in America. Gallagher, Eugene V., Ashcraft, W. Michael, 1955-. Westport, Conn.: Greenwood Press. ISBN 9780313050787. OCLC 230763437. ^ Seager, Richard H. (2006). "peace+culture+and+education"&hl=en&sa=X&ved=0ahUKEwjz5Y2w1bTaAhXB5YMKHRA9Db44ChDoAQg_MAQ#v=onepage&q=soka%20gakkai%20"peace%20culture%20and%20education"&f=false "Soka Gakkai International-USA". Encountering the Dharma : Daisaku Ikeda, Soka Gakkai, and the globalization of Buddhist humanism. Berkeley, Calif.: University of California Press. p. 68. ISBN 9780520939042. OCLC 808600561. ^ E., Hammond, Phillip; Machacek, David (1999). Soka Gakkai in America : accommodation and conversion. Oxford [England]: Oxford University Press. ISBN 9780198293897. OCLC 40298264. ^ Wilson and Dobbelaere, Bryan and Karel (1994). A Time to Chant. Great Britain: Oxford University Press. pp. 243–4. ^ Macioti, Maria Immacolata; Capozzi (tr), Richard (2002). The Buddha within ourselves : blossoms of the Lotus Sutra. Lanham: University Press of America. ISBN 978-0-7618-2189-2. ^ Alfred, Metraux, Daniel (1996). The lotus and the maple leaf : the Soka Gakkai Buddhist movement in Canada. Lanham, Md. : University Press of America. ISBN 978-076180271-6. OCLC 34076743. ^ Clarke, Peter B. (2006). "Globalization and the Pursuit of a Shared Understanding of the Absolute: The Case of Soka Gakkai in Brazil". Buddhist missionaries in the era of globalization. Learman, Linda, 1950-. Honolulu: University of Hawaiì Press. pp. 123–139. ISBN 978-082482810-3. OCLC 56648172. ^ Rocha, Cristina (2016). "Buddhism in Latin America". Oxford Handbook of contemporary Buddhism. Jerryson, Michael K. New York. p. 306. ISBN 978-019936239-4. ^ Fowler, Jeaneane D. (2009). Chanting in the Hillsides : the Buddhism of Nichiren Daishonin in Wales and the Borders. Fowler, Merv. Brighton [England]: Sussex Academic Press. ISBN 978-184519258-7. OCLC 235028985. ^ Alfred, Metraux, Daniel (2001). The international expansion of a modern Buddhist movement : the Soka Gakkai in Southeast Asia and Australia. Lanham, MD: University Press of America. ISBN 978-076181904-2. OCLC 45195856. ^ Ionescu, Sandra (2013). "Adapt or Perish: The Story of Soka Gakkai in Germany". Japanese New Religions in Global Perspective. Clarke, Peter B. Hoboken: Taylor and Francis. ISBN 978-1136828652. OCLC 862613119. ^ a b Clarke, Peter B. (2013). Japanese New Religions in Global Perspective. Clarke, Peter B. Hoboken: Taylor and Francis. p. 23. ISBN 9781136828652. OCLC 862613119. ^ Seager, Richard (2001). "Buddhist Chanting in Soka Gakkai International". Religions of the United States in practice. McDannell, Colleen. Princeton, N.J.: Princeton University Press. p. 112. ISBN 9780691010014. OCLC 47160933. ^ Hurst, Jane D. (1992). Nichiren Shoshu Buddhism and the Soka Gakkai in America : the ethos of a new religious movement. New York: Garland Pub. p. 322. ISBN 9780815307761. OCLC 26503746. Full disclosure statement: Although Soka Gakkai retains the copyrights on the foregoing two works and financed their publication, they show some deviation from similar works published under Soka Gakkai's own name. Metraux, Daniel, The Soka Gakkai International: Global Expansion of a Japanese Buddhist Movement, http://onlinelibrary.wiley.com/doi/10.1111/rec3.12070/abstract, Religion Compass, v. 7#10. Asai, Nissatsu (1893), Outlines of the Doctrine of the Nichiren Sect: With the Life of Nichiren, the Founder of the Nichiren Sect, edited by the Central Office of the Nichiren Sect. Broughton, B.L. (1936), "Nichiren Shonin". In The Maha-Bodhi, vol. 44. Calcutta, The Maha=Bodhi Society. pp. 317–322; 375–391. Lloyd, Arthur (1912), The Creed of Half of Japan 1912. New York: E.P. Dutton & company. Anesaki, Masaharu (1916), [https://play.google.com/store/books/details?id=Ub0KAAAAYAAJ Nichiren, the Buddhist Prophet, Cambridge: Harvard University Press. Reischauer, August Karl (1917), Studies in Japanese Buddhism, New York: Macmillan. Satomi, Kishio (1923), Japanese Civilization, its Significance and Realization: Nichirenism and the Japanese National Principles, Routledge, 2013 (digital reprint). Takakusu, Junjiro (1947), The Essentials of Buddhist Philosophy, Honolulu: University of Hawaii Press. Shimpan Bukkyō Tetsugaku Daijiten (新版　仏教哲学大辞典: "Grand dictionary of Buddhist philosophy, rev. ed."). Seikyo Shimbunsha, 1985. No ISBN. Kyōgaku Yōgo Kaisetsu Shū (教学解説用語集; "Glossary of Nichiren Shoshu Buddhist terms"). (Rev.) Kyōdō Enoki, comp. Watō Henshūshitsu, 2006. Shoryo Tarabini (undated). "A response to questions from Soka Gakkai practitioners regarding the similarities and differences among Nichiren Shu, Nichiren Shoshu and the Soka Gakkai"